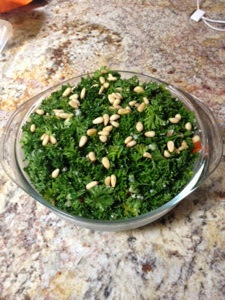 I wanted to be super culturally appropriate and make one of my favorite Lebanese dishes: Tabbouleh. It usually has cracked wheat in it but since I am trying my hardest to avoid anything wheat/gluten-y i decided to try it with cauliflower instead. I couldn't taste a difference so i am super proud of myself. I went a little rogue with it and added things to it. 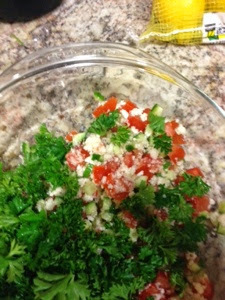 Put desired amount of cauliflower into a blender or food processor. blend till it is small pieces. 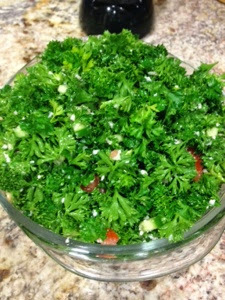 Mix tomatoes, cucumbers, cauliflower, and parsley in a bowl. squeeze desired amount of lemon juice and mix it all together. Let sit in the fridge for a bit so it all melds together. 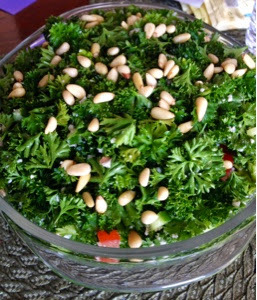 Garnish with pine nuts. 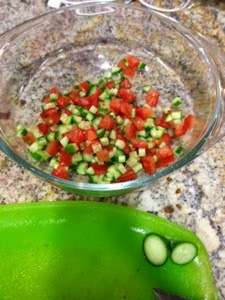 You may add the olive oil now if you choose to use it. My sister and I ate it for two days and it stayed crisp. 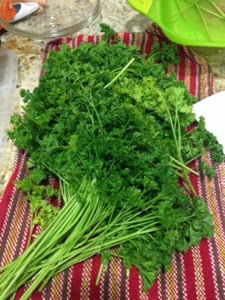 We ate it with other Lebanese dishes- Hummus and Baba Ghanoush. I also mixed it in with other salads.